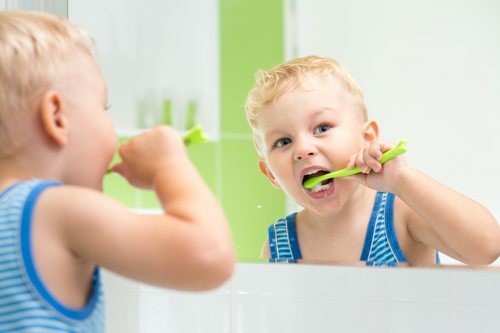 Baby teeth may be temporary, but the habits that children develop while caring for their teeth can shape their dental routine in adulthood. That’s why it is so important that children understand the benefits of healthy teeth, learn how to care for and protect their smiles, and discover that visiting the dentist can be a positive experience. Although the primary teeth are destined to fall out and make way for permanent teeth, they should not be dismissed as disposable or unimportant. Primary teeth allow for proper biting and chewing, a function that is vital if you want your child to eat a healthy, nutritious diet. They also have a major impact on your child’s appearance and the development of his or her speech. In addition, primary teeth help to establish the correct spacing for the permanent teeth and encourage the proper development of the jaw bones and muscles. With so many crucial purposes, it is vital that baby teeth are cared for properly at home and during regular visits to the dentist. No matter how young a child is when they begin visiting a dentist, routine dental visits alone are not enough to ensure healthy teeth. Establishing a good oral health care routine is vital. That’s why you want your child’s dentist to go beyond cleaning and caring for their teeth. Teaching children how to look after their teeth and gums properly and educating them on the importance of brushing, flossing, and regular dental checkups is incredibly important. When children understand the value of a healthy mouth, they won’t just smile today; they will be prepared for a healthy tomorrow. It is human nature to avoid things that are considered unpleasant. If your children’s early encounters with the dentist are uncomfortable, frightening, or even traumatizing, they may grow into adults who dread regular dental checkups. Worse, they might develop the habit of avoiding the dentist and end up with serious oral health issues. Fortunately, there is a simple way to help your child view the dentist as a friend who can help them in their quest to grow up healthy: Choose a dentist with experience in pediatric dentistry. The dentist will make every effort to settle your child’s rattled nerves and calm their fears so that their dental appointments are fun, comfortable, and productive. Making dental health a priority at a young age can help prevent future problems, and by educating your children about oral hygiene now, you can provide them with the tools they need to care for their teeth for a lifetime. In addition, your children’s dentist can answer any questions you have about your child’s dental health, helping you understand what to expect in the months and years ahead. Is your child due for a dental appointment? To learn more about our pediatric dentistry services or to schedule an appointment, contact Duff Family Dental today.